LONDON--(BUSINESS WIRE)--Technavio analysts forecast the global VoIP services market to grow at a CAGR of almost 10% during the forecast period, according to their latest report. The research study covers the present scenario and growth prospects of the global VoIP services market for 2017-2021. The report considers the revenue generated by VoIP service providers and connectivity service providers for offering VoIP services suites. During 2017-2021, with increased smartphone and LTE-enabled device adoption, the VoIP services market is likely to expand significantly. The development of various VoIP applications for smartphones in the form of messaging and voice and video calls at reduced prices helps more customers to adopt VoIP services. During 2018-2020, many developed and emerging nations would be completing the process of LTE network infrastructure deployment, thus enabling VoIP to gain a high subscriber base. Also, strategic alliances of telecom operators and OTT players in the established markets are fueling the growth of the VoIP market. The market will mostly be driven by developing regions with the increasing availability of high-speed broadband services and the increased consumer awareness of IoT applications, such as connected homes and automobiles. Consumers are increasingly using computing devices for multiple purposes, such as accessing apps, reading the news, surfing the web, and checking email and social media. The growth of IoT is another reason for the growth of the market, as most IoT devices are controlled by apps installed on mobile computing devices. In 2015, the unit shipments of mobile computing devices reached 1.91 billion units. With constantly changing business scenarios, it is necessary for organizations to develop a mobile workforce to stay competitive. Constant changes in work locations, time zone barriers, and the need to access official and confidential data via an employee’s personal device are resulting in the adoption of BYOD policies. BYOD results in the elimination of hardware device costs. Employees prefer these policies as they enable them to use one device for both personal and professional use. BYOD applies to smartphones, laptops, and tablets. In 2015, smartphones held a 58.56% revenue share in the global BYOD market. This can be attributed to the fact that mobile developers are developing mobile apps that are comparable to popular programs, such as Microsoft Excel, Microsoft PowerPoint, and Microsoft Word. Wireless technology is advancing at a very fast rate; by the time end-users worldwide started consuming 2G wireless technology, 3G was introduced in the market. Wireless technology is evolving in tandem with the development of the smartphone. End-users in many countries are using 3G technology, while developed countries are already into 4G LTE wireless technology. Telecommunication product-based vendors are working alongside service providers in developing portable devices that support 4G LTE advanced wireless technology such as mobile hotspot routers. Hotspot router vendors are constantly equipping hotspot devices with support for 4G LTE. Become a Technavio Insights member and access all three of these reports for a fraction of their original cost. As a Technavio Insights member, you will have immediate access to new reports as they’re published in addition to all 6,000+ existing reports covering segments like cloud computing, data center, and IT hardware. This subscription nets you thousands in savings, while staying connected to Technavio’s constant transforming research library, helping you make informed business decisions more efficiently. 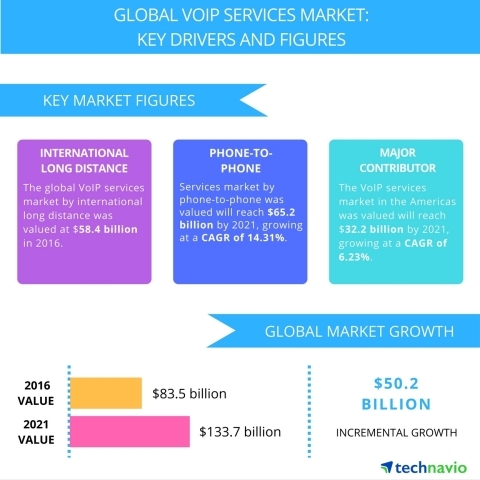 Technavio analysts forecast the global VoIP services market to grow at a CAGR of almost 10% during the forecast period, according to their latest report.